Everyone in this world is struggling with their own set of challenges be it having issues with career or family or health. There was a time when I was having issues with my weight few years back when I had drastically put on a lot of weight because of my careless binge eating habits. On account of which I tried a bunch of ways to lose weight from starving to workouts. 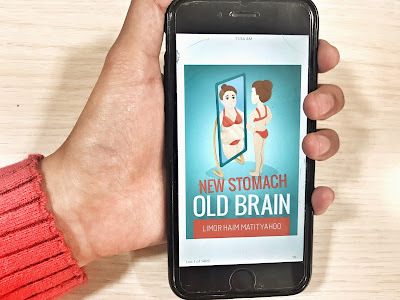 I had recently read a book by Limor Haim Matityahoo called "New Stomach Old Brain" which reveals a different aspect and story of the author who had always had weight issues and how she dealt with it before and after her weight loss surgery. What I loved about the book is its simple and straight forward language, there are very few or perhaps no jargon (technical terms) that may be difficult to understand. A straight from the heart language has been used to portray the experiences of author's life. Every foodie can totally relate to the habits of the author, how she loved every kind of food and couldn't resist finishing her plate. Being a food lover myself, I could utterly empathize with the words written in the book. This book is for every person with a significantly good appetite who has been struggling from their weight all their lives. And is especially for those who are considering to undergo a weight loss surgery or have gone through the same. It empowers the self esteem of obese people and emphasizes on the reasons why people are prone to eat more than they actually require. It idealizes the idea of not following the myths or presumed practices that are imposed on you since childhood and encourages the readers to always listen to their heart. It also lays stress on the repercussions of excessive dieting and an alternative "non-diet approach" which is by the way a great way to stay healthy and fit. One thing that is evident about this book is that it only shows author's single minded perception about weight loss and someone with a different or conflicting approach may not follow what author believes.